Male protagonists seem to be in short supply in this year’s Lovelace nominee so Top of the Order is a nice addition for young male readers. Jackson Kennedy is in 5th Grade. He loves baseball and is both dreading and anticipating the fast-approaching end of elementary and beginning of middle school. His best friends Gig and Isaac, along with new student Diego form a tight group. The story is basically about friendship, loving baseball and how those two things help Jackson navigate his way through his thoughts and feelings about growing older, his parents, and the parameters of his responsibilities to both himself and those he cares about. Unable to round up a ninth player for their school baseball team, the boys are shocked when Gig’s sister, Sydney, shows up at practice and wants to be on the team. Turns out she’s pretty good and she’s there because she really wants to play. Gig is angry about what he sees as his sister’s attempt to horn in on something that has always been special to him. Jackson is caught between wanting a good player to complete their team and his loyalty to Gig. This dilemma is well-plotted and rings absolutely true for both boys. The book’s biggest problem: the author takes what is a good, basic theme on top of which he has constructed a solid, well-plotted basic story and cluttered it up with a lot of frilly plot asides that end up confusing and detracting from a GOOD story about Jackson. The added aside about Gig and Sydney’s father shipping out with his National Guard Unit for Afghanistan is unnecessary as it doesn’t add anything to the actual story. The author alludes to Diego’s extra responsibilities at home which apparently conflict with his ability to be a memeber of the team. This particular point disappears from the story about a third of the way in, so it could also be completely deleted from the book’s pages and not affect Jackson’s journey or the outcome. There is also a side plot involving a website called FutureMe.com where individuals can send themselves messages/emails in the future. While an intriguing idea, its inclusion in the story speaks more to the author’s fascination with the idea than its appeal or importance in the story itself. Jackson’s voice is genuine and heartfelt. His feelings about his parents’ divorce and the idea of his mother’s dating experiences will resonate with every kid who has ever been in that situation. I was also happy to discover that John Coy is a local (Minneapolis, MN) author. I am always looking for worthwhile children’s books written by local authors; my 3rd and 4th Grade students always find this connection exciting and it often motivates them to read a book that might not otherwise have attempted! 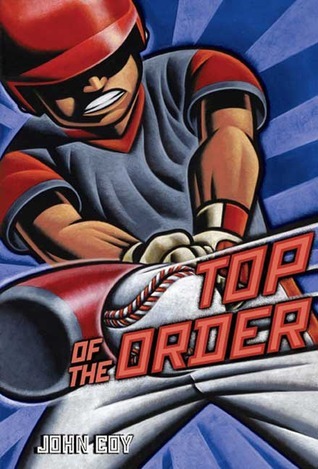 Readers: if you enjoy baseball and 5th Grade antics in school–make Top of the Order one of your choices for the Lovelace nominees!